As you all know "FairTax The Truth: Answering The Critics" (the second book) was expressly written to answer the purposely misleading lies told about the FairTax. Of course these lies have persisted & in many cases have backfired against the people who told them - like several cases in Georgia where the people are so educated about the FairTax thanks to the Neal Boortz radio program that originates in Atlanta. 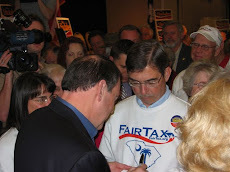 Tea Party candidates & Tea Parties themselves have experienced the same sort of distortions as the FairTax. An observant member of our group mockingly wrote - "I was shocked - no mention of The Morristown Tea Party in the Star Ledger. Maybe the media is afraid of this movement - according to various articles Tea Party candidates are growing in strength - and many of these "unknown" candidates running for office are winning in various polls." Now we can add that it is not just what you read but what is not printed also that is a distortion that you have to be aware of - or simply just cancel your subscription to the paper so you don't have to play this hide & go seek game that you are destined to lose. With re to newspaper articles that were printed on the Morristown Tea Party some papers purposely underestimated the size of the crowd & I am so glad that none of you fell for that. We gave out more pocket cards than some papers reported as the attendance. Tea Party candidates are experiencing the same sort of treatment such as when the detestable Harry "Ringside" Reid fills the Nevada airwaves with attack ads saying that his rival Tea Party Senate candidate Sharron Angle wants to cut Social Security benefits. Of course Ringside Reid is counting on kicking the can just far enough down the road that he will be out of office in retirement before the can goes over the cliff to everyone's financial peril except his own. I hope the successful Tea Party candidates will join Jim DeMint (SC) & Tom Coburn (OK) in their own Senate caucus, separate & distinct from the Republican establishment, to start a third powerful party for America - Rand Paul - KY, Sharron Angle - NV, Ken Buck - CO, Mike Lee - UT, Christine O'Donnell - DE, Marco Rubio - FL, Linda McMahon - CT, Pat Toomey - PA, & the latest Joe Miller of AK. These are the type of people we need to attract other strong people of substance to a new caucus - not career pols like Mitch McConnell, John Boehner, Rodney Frelinghuysen, or Leonard Lance. Please watch this video of the great Herman Cain talk about the attack adds against the FairTax. Mr. Cain ends by asking "if they are misleading me about the FairTax what else are they misleading me about?" 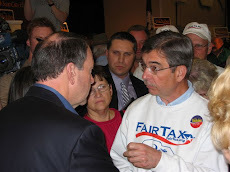 That was the very question Carol asked me when Rush Limbaugh purposely mislead his audience one day in February 2008 when Governor Huckabee was getting a little too close to the Republican nomination to suit the smart money - Rush said "what kind of fool would want to see prices go up by 30% under the FairTax?" And of course the only fools were those in his audience who believed any sane person would be for such a thing. Carol & I have never listened to Limbaugh again. to be right 98.6% of the time. You might toy with the idea to call the show if you have the time to wait and be heard. about the Fair Tax. He is tough so be prepared with a cool head. Response: Thanks for your thoughts. I have been on Rush's show twice. I started the Media Investigation Committee to investigate people in the media to find out if they just don't understand the FairTax & need a briefing to help them out or to find out if they have another agenda. Rush is a showman who I believe could argue Allen Colmes' point of view & be persuasive to an equal number of people who listen to him now. Rush is friends with Neal Boortz - the part of the story I didn't tell is that Neal heard the same thing we heard & the next day Neal said on his show that it was like Rush stuck a knife in his back - some friend. The point to me is when you find them telling you something you know is not true what else are they telling you that is not true so you have to be careful. I understand the part about getting to a large audience but I drop people, newspapers, TV shows, etc when I think they are enemies of America - that to me is the bigger picture. We know that Rush knows that he purposely misspoke to lead people away from the FairTax & Huckabee. Please reverse your point & ask how much good Rush would do for America if he regularly pointed out the benefits of enacting the FairTax - much better than me trying to sneak in one question. But promoting the FairTax goes against his agenda which is to be the biggest radio talk show host of them all. Enactment of the FairTax would vault Neal Boortz to that position & we both know that Rush's ego could not stand that. I doubt he is too happy with Glenn Beck as it is. He could not stand the FairTax being enacted so America can take it on the chin in the meantime while Rush makes hundreds of millions of dollars each year with the system just the way it is.